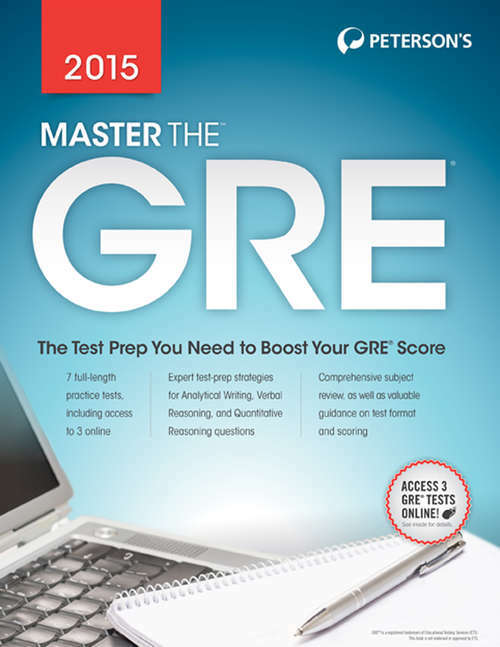 Peterson's Master the GRE® 2015 is your one-stop guidebook for preparing for the GRE test. This comprehensive eBook is organized into six parts that include basic information about the test, a diagnostic and three practice tests, and detailed test prep for the Analytical Writing, Verbal Reasoning, and Quantitative Reasoning sections of the GRE. Inside you'll find 7 full-length practice tests, including access to 3 online, with detailed answer explanations and a thorough review of all GRE® General Test subject areas: Analytical Writing, Verbal Reasoning, and Quantitative Reasoning. Also included is expert advice on GRE® question formats, scoring, and what to expect on test day. Additional resources include valuable guidance to help you score high on the Argument and Issue Task essays, helpful tips for using the on-screen calculator and answering numeric entry questions strategies--everything you need to boost your GRE score.